First of all, we believe that the obligation of buying a classroom library belongs with the school or school board. We don’t think teachers should have to spend their own money to fund their classroom library, but we also understand that because of the giving nature of teachers, you are more likely to buy books for your students than to have them go without. Just be mindful of how much you spend over the years. It can add up FAST! Make sure you carefully label your personal classroom library books so they can easily be separated from the school owned books. 1. Buy them. Yes, most teachers have to buy their own classroom library books. Rather than paying full price for new books try garage sales, used books stores, public library sell-offs. Sometimes retired teachers and teachers leaving the classroom have books they are giving away for selling for cheap. Occasionally you can get a coveted invitation to a warehouse sale through your local public library or Scholastic. And don’t forget about those tiny little used book stores no one seems to know about where sometimes you can get a lot of books for a fraction of the price. If you’re in the Edmonton, Alberta, Canada area check out Kids Books 4 Less. 2. Ask for donations. Lots of families have lots of books sitting around at home collecting dust and most parents are happy to get them out of the house. Write a note explaining the types of books you are looking for and where to bring donations. Be sure it’s clear these are donations to the school so no one is surprised when the book isn’t returned to the family. 3. Talk to your coworkers. Lots of teachers change grades and are left with all their classroom books for the wrong grade. Maybe they have a classroom library for the grade you need and are willing to sell, lend or give to you. Just be wary of receiving old books that your students are not going to want to touch (because they are smelly, dusty or completely out of date). 4. Trade halfway through. We share our classroom library with another teacher with the same grade. Halfway through the year we switch all the books in our classroom to her classroom and she gives us all of hers. That way we only need half the books. This can also work with friends who teach the same grade at another school or the grade above or below yours. As a bonus we have our students carry all the books from one room to another and they get really excited to see all the new titles as they are carrying them and putting them away on the shelves. 5. Watch for library discards. Sometimes these books are given away for free. Your school library or even the public library sometimes need to weed out extra copies. Sometimes these are BRAND NEW! 6. Ask for money. If the books are going to remain with the school instead of your personal classroom library, ask your administration for money. It might work. If there is no money perhaps a fundraiser might work. Maybe your parent council has money for books? There is no harm in asking. 7. Write grants or apply to sites like donorschoose.org While school boards in Canada have stricter rules about how teachers raise money for their classrooms, it might be worth looking into grants from private businesses like Chapters/Indigo and the Love of Reading Foundation. 8. Enter contests. Scholastic often has contests for book prizes. It takes time, but it can help build up the classroom library. 9. Sign up for Scholastic Book Clubs. When parents buy books, you earn rewards that can be used to purchase new books. Contact Scholastic in your country to set up an account. Scholastic Canada You can even host a book fair. Yes, they are a lot of work, but maybe your parent council can help with spreading the work out over a couple of days. Schools can earn up to a few thousand dollars depending on the size/economic situation of your school population. 10. Use your school library. We often sign out 20-30 books and keep them in the room for about a month. It’s easy to switch out the books and they’re free. 11. Look for online options.Epic! is an online lending library available to teachers for free. You can create accounts for your students where they can access so many great books! 12. Look for local companies. Some local companies are willing to partner with your school to get books in the hands of students. Approach family owned businesses to see if they’d like to sponsor your school to buy some books. 13. Look for non-profit organizations.First Book Canada is an example of an organization that works to get books for students. A similar organization in the United States is Kids Need to Read. 14. Join book reviewer organizations. If you preview books, read them and write reviews you can often get a free copy of the book. Yes, it takes time to read these and write the reviews, but if you’re already an avid reader this might be a way to get your hands on new books. 15. Create a wish-list. On your Amazon account you can create a wish list. You can share your wish list with the families in your school to ask them to purchase books for the school instead of gifts for teachers. 16. Fund Raise. Yup, have a good ol’ bake sale or popcorn sale where the proceeds go to purchasing books for your classroom. Be up front that the sale is to buy books for the school and check with your district’s policy on fund raising of this kind. 17. Talk to your community librarian. Most public libraries are affiliated with schools and have a librarian whose job is connect with schools. 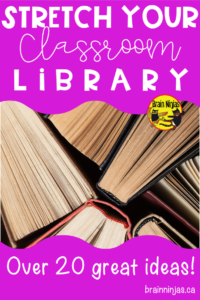 These librarians can share information about reading programs, get your students signed up with library cards and might know of some great ways to get your hands on more books. 18. E-books and Audiobooks are your friend. You would be shocked to learn how many programs have been purchased by your school district. 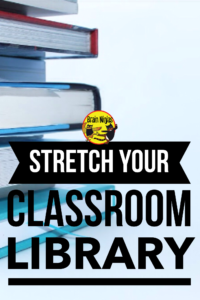 If your school already owns the licencing, there is probably a few quick steps to get your classroom touching (virtually of course) those books. A program like Reading A-Z (Raz-Kids) might be licensed by your school. 19. Read aloud. Sometimes you don’t have enough books and so reading to your students can be one way to spread the love of reading. 20. Explore. If you search online you can find all kinds of interesting ways to find online audiobooks. 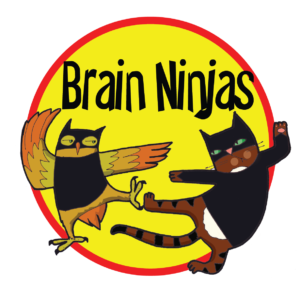 Many of these are for younger students, but for upper elementary books try Funbrain. It has featured books that students can read online. For best results access this from a laptop, desktop or Chromebook. It’s a little glichy for tablets. Don’t be discouraged if you can’t get your hands on a lot of books right away. It takes time to build up a quality collection. 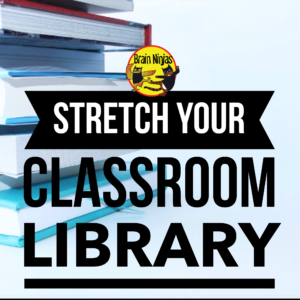 Your classroom library reflects your priority about teaching reading. When you don’t have books available for your students, you are giving them the message that reading isn’t important. You’re a teacher. You know that as students move further up the grade levels, they shift from learning to read into reading to learn. If they’ve missed reading skills along the way, they are already identifying as ‘not a reader.’ You can shift this thinking by offering multiple opportunities every single day. Ok, I’ve tried all of this and I still don’t have enough books for my students. Don’t sweat it. You will get there. If it’s a case of ‘can’t afford’ you still have lots of options. Visit your school library. Take your kids to the library as often as possible for now. If your school has a schedule, try to find a time that works when your class can spend a bit of extra time in the library (even if it’s just to do some work with a change of scenery). Host a read aloud. Read out loud to your students (because even older students enjoy listening to their teacher read them a book). Maybe take it a step further by inviting local celebrities to read to your students (or your mom). Parents, grandparents, older students or principals can also make great guest readers. Don’t forget about that public library. Ask your public library to come help students sign up for library cards to your local public library. If your school is nearby maybe you can visit the library occasionally. The more books available to your students, the more they will have the opportunity to read. Show them reading is a priority in your classroom by creating opportunities to share their love of reading. Look for alternatives to traditional books. Can you read magazines? What about online blog posts. If you have access to a computer in your classroom you have lots of options for reading material. Don’t forget about those old dusty textbooks. Sometimes a few pages on a topic that interests a student might be just enough for a reading session. Pair read. Match up two students who will sit together to read a book. They can alternate between each other to read out loud, read silently side by side (waiting for each other at the end of the page) or read in unison together. This also creates a built in partner to discuss the book. Share Your favourites. You probably have a personal copy of your favourite book. Share it with a trusted student (well, maybe not if it’s a signed first edition) or buy one extra copy to read to your class. If you tell people it’s your favourite you’re like to get a copy as a gift along the way. Include parents in your plan. Explain to parents your book shortage and how they can help by reading at home every chance they get. Encourage them to get to the public library and then share what they have been reading at home. Ask parents to talk with their children regularly about why reading is so important to learning. Never stop advocating. Teachers should not have to spend their own money to buy books, but we will admit to spending thousands of dollars over the years to buy books so that our students will have them to read. We continually talk to the powers that be (principal, superintendent, government officials in charge of education, school boards) that more needs to be done to ensure the resources students need are included in classrooms. Do you have any tips for getting more books into the hands of your students? Leave us a comment below. Sign up for our email list. We’ll send you newsletters, tips, tricks and occasionally free resources. You’ll also get access to our Resource Library.